There is nothing like the pleasure of breakfast in bed. Or lunch, dinner or even drinks for that matter. Truly great suites are the ones you never want to leave, so these luxury hotel properties have created experiences that celebrate the art of staying in. Get ready to hang that do not disturb sign. 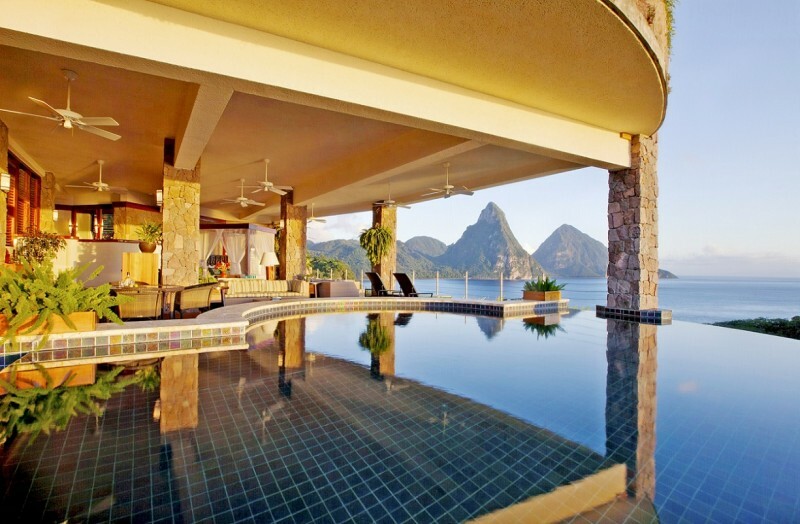 Once guests check into one of Jade Mountain‘s private 3-walled, open-air sanctuaries (you won’t find average guest rooms here! ), named after the galaxies and featuring private infinity pools, 15 ft. high ceilings, and tropical hardwood hand-selected from the Rainforest of Guyana, they find it really hard to leave. But hunger calls, so the service team at Jade Mountain have created the Six In Your Sanctuary in-room experience that includes a six-course chef tasting meal complete with a wine pairing. 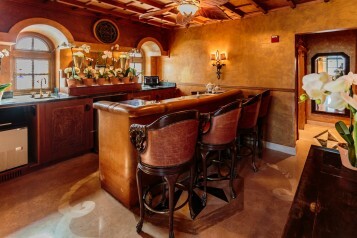 Looking for more ambiance that the Piton Mountain view is offering? The experience can included an acoustic guitarist to serenade you during the meal. Set just outside of Florence, Il Salviatino is a stylishly restored 15th century villa that seamlessly blends authentic Italian charm and modern luxury. 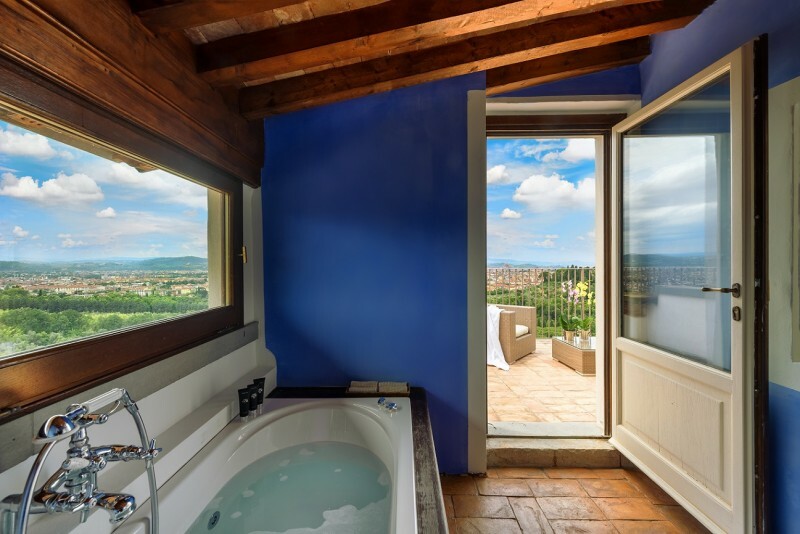 The property’s hidden gem is the Ojetti Suite – a two-story haven with a rooftop bathtub on a private balcony where guests can enjoy gorgeous views of the rolling Tuscan hills. It’s up here that the property’s “The Ultimate Bubble Bath” reveals itself. They’ll arrange for the tub to be turned into a fizzy fantasy – filling it to the brim with your favorite “bubbles” – Prosecco, Spumante or French Champagne. An additional chilled bottle is provided to ensure the ultimate experience — whether you’re traveling with your SO or solo. At the five-star, history-rich JW Marriott El Convento Cusco, guests receive more than just a chocolate on a pillow at turndown. The “Sweet Journey Around Cusco” invites travelers on a delicious, cultural adventure right in their hotel room. 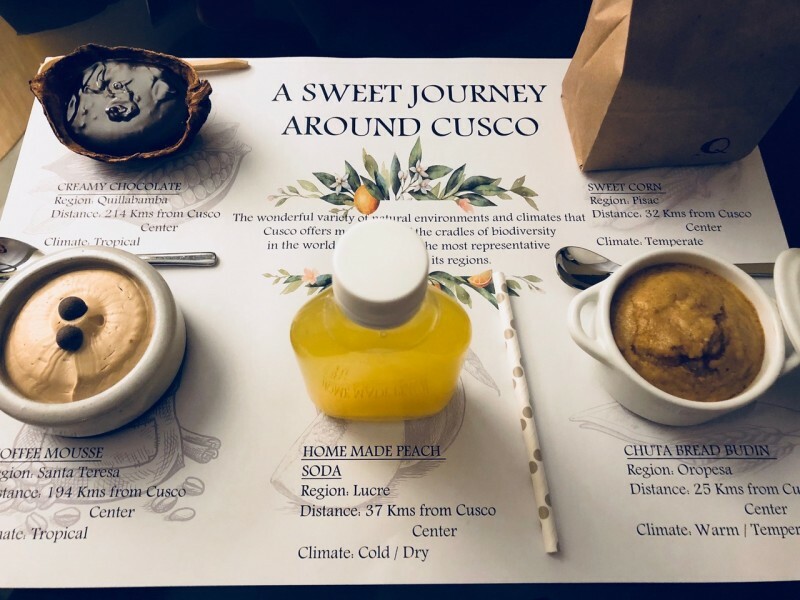 Featuring five unique local favorites, guests can taste delicacies like the creamy chocolate from the Quilabamba region or indulge in the home-made peach soda from the Lucre region. Known for its variety of natural environments and climates, guests are able to experience different areas of Cusco before turning in for a good night’s sleep before heading out to explore its cobblestone streets the next day. 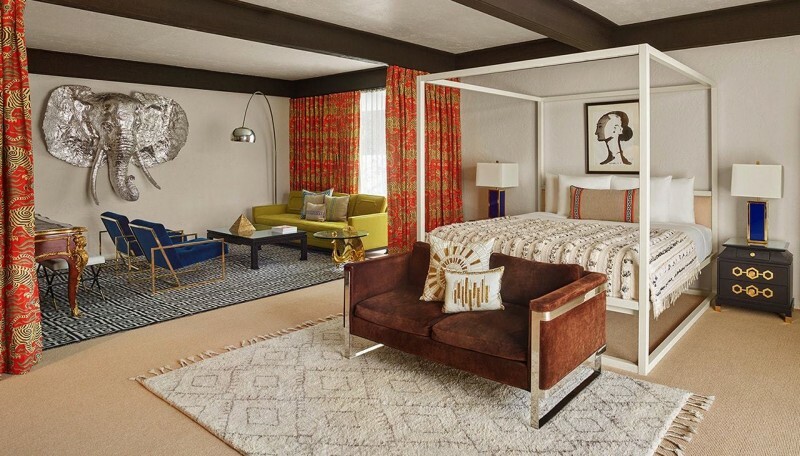 The Parker Palm Springs is known for its one-of-a-kind design-centric suites like the Gene Autry, outfitted with its own front , private patio, spa treatment room and screening room, all energetically designed by Jonathan Adler – think brass elephant heads and lots of texture. So it’s only natural that breakfast would come with a bit of fanfare. Ring the team for the Zillion Dollar Frittata – their room service offering from Norma’s that includes at $1,000 lobster omelette surrounded by an ounce of Sevruga caviar. Feel free to supersize it for 9 more ounces. Photo Credit: Four Seasons Resort, Koh SamuWhen your infinity pool overlooks the Laem Yai Bay and the Gulf of Siam, how could you ever imagine getting out of it? The concierge at the Four Seasons Koh Samui understands, so for those evenings when the sunset is too stunning to walk away from, order up the private dining Bucket Barbecue. 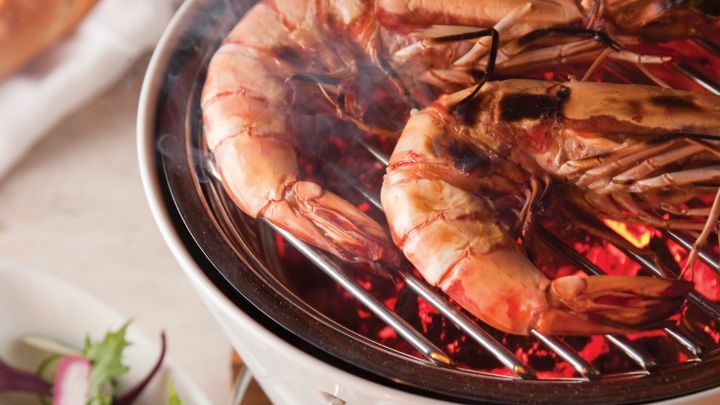 They’ll bring in a “bucket barbecue” complete with red-hot coals for perfect grilling, as well as your choice of New Zealand Murraylands lamb chops, Wagyu rib eye, jumbo tiger prawns, sides, desserts and a paired wine, or a matching bucket of beer. Sit out on the deck, gaze at the stars, enjoy a dip in your pool, and indulge in the best backyard barbecue ever. Some resort waiters use the elevator. 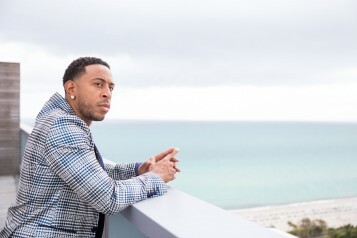 But why opt for technology when you‘ve got French Polynesia in the background? 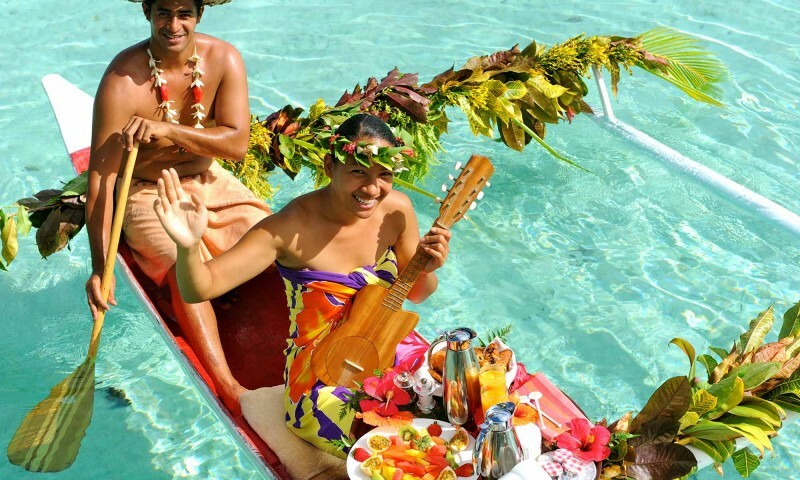 At the Le Taha’a Island Resort and Spa, breakfast is delivered directly to your private deck via canoe on the Taha’a Lagoon. A ukulele playing local is aboard, the music replacing the doorbell to signal their, and your food’s, arrival. 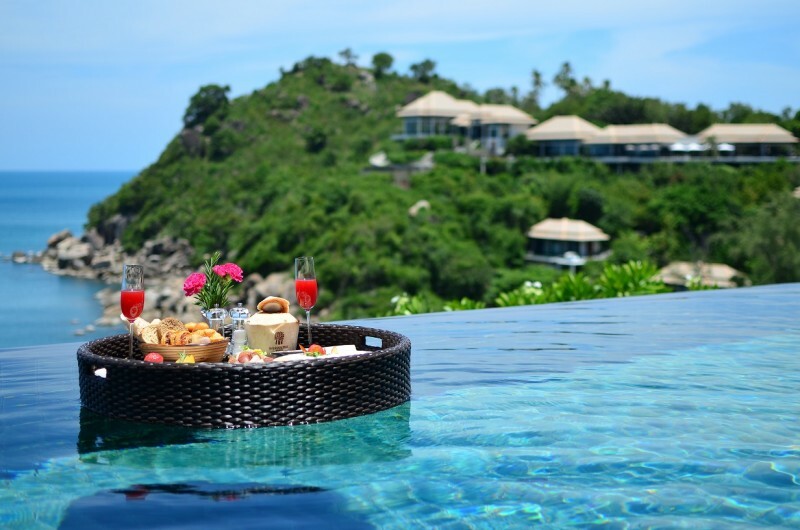 Each of the 88 villas at the Banyan Tree Samui are outfitted with their own infinity pool and Jacuzzi overlooking the beach and bay of Thailand. So breakfast in your bathing suite is a given. The a personal Villa Host concierge can arrange for a Floating Breakfast to start the morning off. The meal served to guests in a floating basket that is gently set into the pool for the ultimate breakfast with a view.